What Do You Ladies Know How to Do? 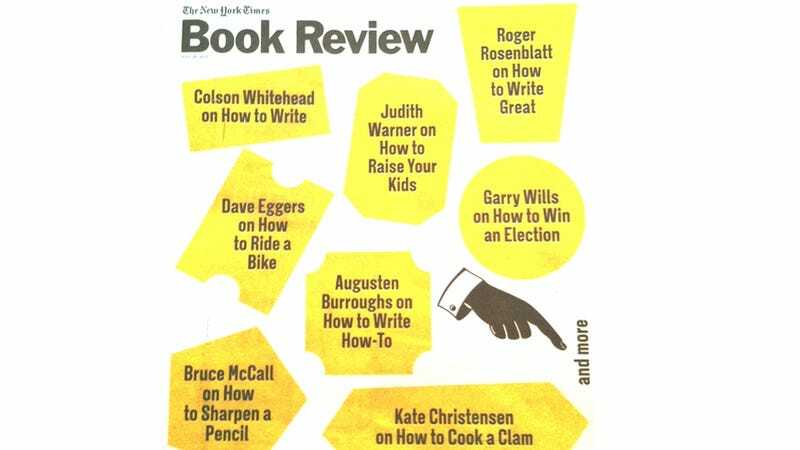 The New York Times Book Review's How-To Issue lists eight pieces on its cover, two of which are written by women. And guess what they're about? Raising children and cooking. I'm sure there's something you know how to do. I'm sure there are things your many brilliant friends know how to do, or something you could write about that has to do with doing a thing (most of the NYTBR pieces were, of course, book reviews). I would like to read the essays, reviews, comics, lists and more we, and they, could write in this vein - irreverent, funny, heartbreaking, ironic, wry, snarky, sweet, clever, brilliant, silly, and everything else. 1. Write a how-to piece on the topic of your choice. Because time moves extra quickly on the internet, I would like to have the first round of essays/reviews/etc. by Sunday, August 5. 2. If you have a blog/Tumblr/LiveJournal/other internet presence, post the piece on your own blog/internet space, and email me a link. 3. If you don't have a blog, send it to me, and I'll post it here. 4. Read and link to the pieces written by other women.